SRINAGAR, APRIL 15: Three days ahead of the Lok Sabha elections to Srinagar Parliamentary Constituency, the Returning Officer Dr Shahid Iqbal Choudhary Monday convened a meeting of all concerned officers and departments to re-sensitise them of their duties and different kinds of plans drawn up for smooth and successful conduct of elections in the Constituency. 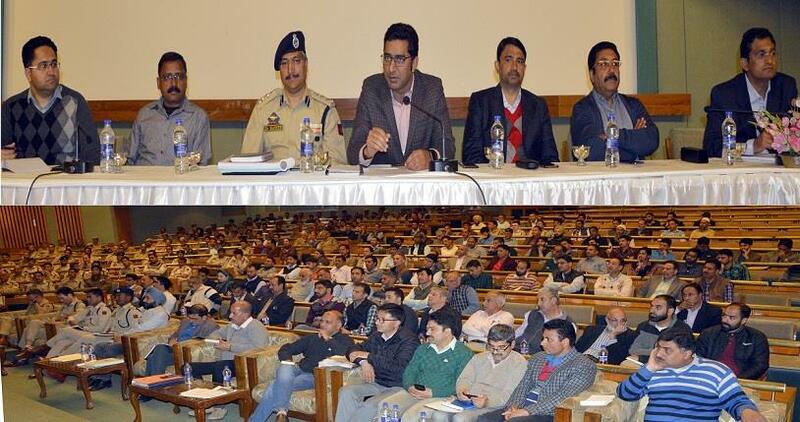 Election Observers for the Srinagar Parliamentary Constituency were present in the meeting. The RO briefed the meeting about the status of preparedness for elections and specific duties of concerned officers. Specific roles, duties and responsibilities of Assistant Returning Officers, Presiding Officers, Zonal and Sector Magistrates and the Police and CAPF involved in the elections were highlighted during the meeting aimed at addressing issues and concerns that the officers might have leading up to the elections. Question and answer session in which a range of queries were raised and answered was also held as part of the marathon meeting. The RO emphasised as-per-plan execution of various plans drawn up at different levels of the election process in the Constituency impressing upon all the concerned officers to ensure that no room is left for laxity or lapses. Details of communication and transportation plans drawn up as part of the election process were also highlighted during the meeting. The concerned officers were asked to ensure strict adherence to all aspects of these plans and complete coordination amongst themselves. The meeting held a special focus and emphasis on carriage and storage of EVM machines giving a detailed brief on their handling with all those concerned asked to ensure the strictest adherence to guidelines in this regard. Discussions in the meeting also highlighted the requirements and plans made for 88 polling stations where webcasting facilities will be available and those 8 polling stations in the Srinagar district which are all-women. SSP Srinagar Dr Haseeb Mughal who was also present in the meeting gave a detailed presentation on the security plan drawn up for the elections. He informed the meeting that the Srinagar district where a total of 857 polling stations have been set up at 401 locations has been divided into 23 zones and 112 sectors with each zone and sector having a corresponding number of zonal and sector officers and magistrates. RTO Kashmir, SSP Traffic, Assistant Returning Officers of all 15 assembly constituencies of Srinagar PC, Superintending Engineers PWD, PDD and PHE, Joint Director Information, Joint Commissioner SMC, General Managers SRTC and BSNL, Deputy District Election Officers Ganderbal, Srinagar and Budgam, All Nodal Officers including those of all-women polling stations, Chief Medical Officer Srinagar, Deputy Director Fire and Emergency Services, All Zonal and Sector Magistrates were all present in the meeting.